Photographic identification guide to the 280 flower species most commonly seen in Sri Lanka. Over 300 high quality photographs from Sri Lanka’s top nature photographers are accompanied by detailed species descriptions, which include nomenclature, size, distribution and habitat. The user-friendly introduction covers geography and climate, the different habitats and flower structure. 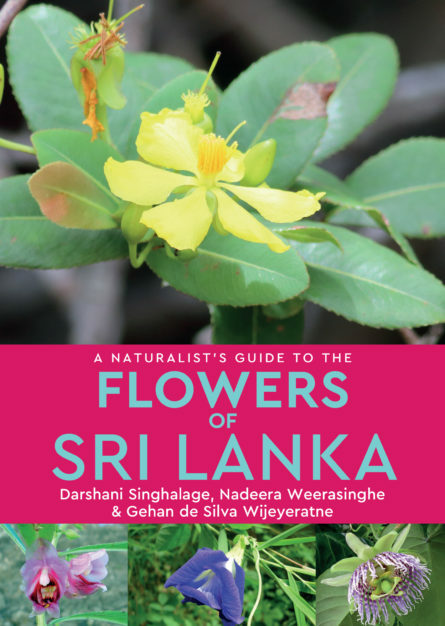 Also included is a complete checklist of the flowers of Sri Lanka. Darshani Singhalage has been documenting and identifying wild flowers in Sri Lanka for over 20 years. She has a BSc special degree in Botany and a PhD in multi microbial biofilms and their benefits in plant growth promotion. She is also a botanical illustrator. She is currently a lecturer in the Uva Wellassa University, Sri Lanka. Nadeera Weerasinghe has worked as a naturalist for Jetwing Hotels and subsequently Ceylon Tea Trails. He has contributed research papers on amphibian fauna and herpetology and has assisted with several television documentaries on Sri Lanka. He has a special interest in photographing and wildflowers. Currently he manages Sir John’s Bungalow in the Knuckles Nature Reserve. Gehan de Silva Wijeyeratne is one of Sri Lanka’s most high profile wildlife personalities. He is passionate about Sri Lanka’s natural history and has authored and photographed over 300 articles for national and international newspapers and magazines on Sri Lankan biodiversity, travel and business topics. His many books include Wild Sri Lanka and the Photographic Field Guide to the Birds of Sri Lanka also published by John Beaufoy Publishing.